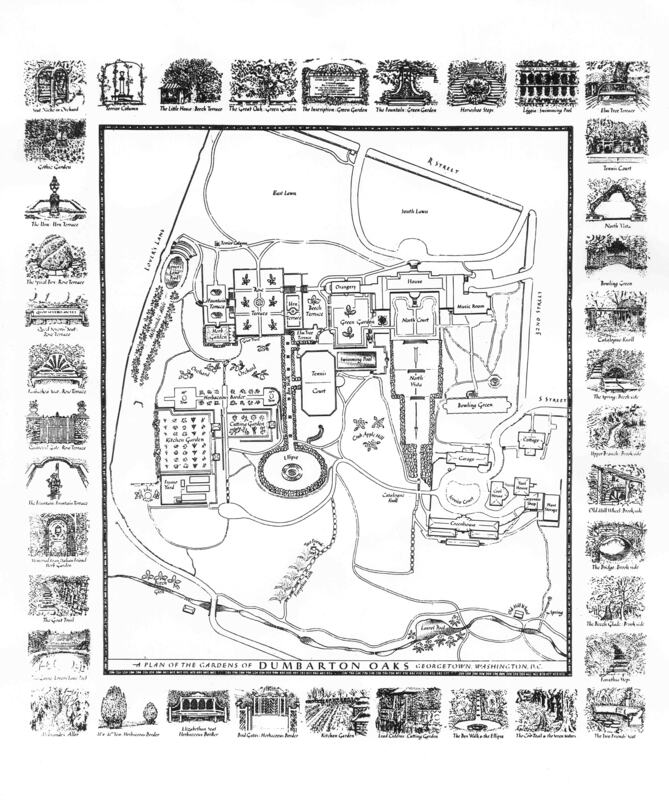 Spencer Lenfield, Map of the Dumbarton Oaks Gardens, 2016. Dumbarton Oaks Archives (AR.AP.GG.SP.051). Discover more about the gardens at Dumbarton Oaks, including details on trees and plants, inscriptions, furniture, and ornaments. Click anywhere on the map below to find out more about a garden section. The original watercolor is now part of the Dumbarton Oaks Archives (AR.AP.GG.SP.051). In 1935, Mildred and Robert Woods Bliss, the founders of Dumbarton Oaks, also sponsored artful renderings of the gardens. They commissioned the Czech-American artist, Rudolph Ruzicka (1883–1978), to make the first map of the gardens. Ruzicka included vignettes of plant materials within the map and framed the map with thirty-eight depictions of garden spaces, hardscape elements, and furniture, as they existed at the time. He labeled the garden areas and depictions, providing the canonical names that continue to be employed. Rudolph Ruzicka plan and vignettes of the Dumbarton Oaks Gardens, 1935. Archives, AR.AP.GG.SP.015, Dumbarton Oaks Research Library and Collection. Also in 1935, the Blisses commissioned the cartographer, Ernest Clegg (1876–1954), to paint a bird’s-eye view of the house and garden to be installed in the overmantel frame of the Renaissance fireplace in their music room. Clegg worked in ink, watercolor, and gouache and employed aerial photographs of the gardens that the Blisses had had made for this project. A digital reproduction of this map now hangs in the overmantel in order to help preserve the original artwork from further fading and deterioration. 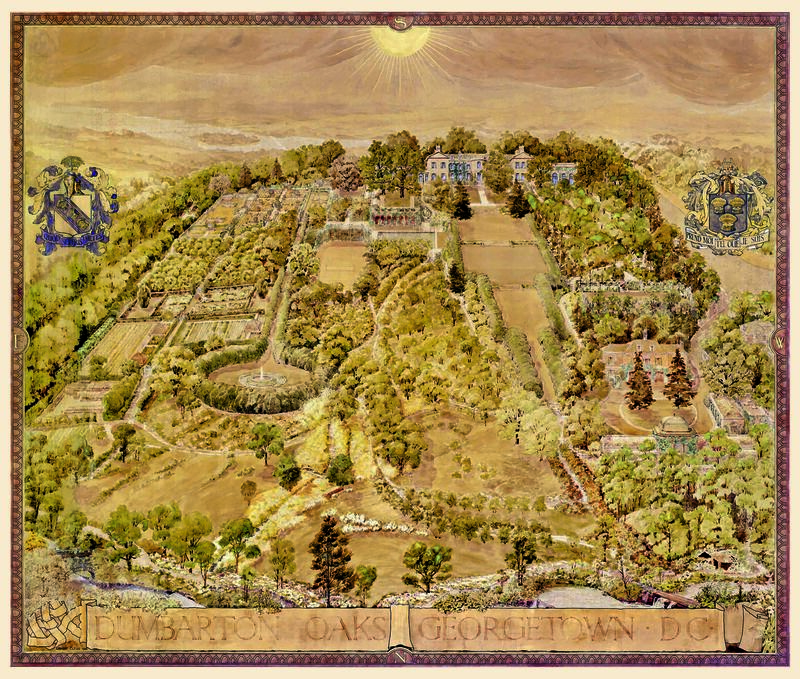 Ernest Clegg, Map of the Dumbarton Oaks Gardens, 1935. House Collection, HC.P.1935.01. (I), Dumbarton Oaks Research Library and Collection.